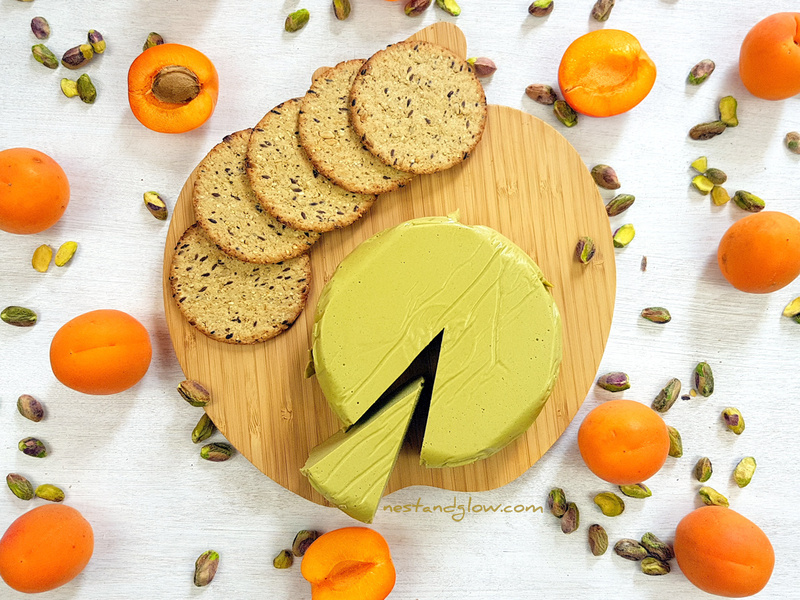 This quick recipe for dairy-free Pistachio Nut Cheese is easy and foolproof. It slices, grates and will go golden brown when grilled. The only difficult part is not eating the pistachio nuts as they are! 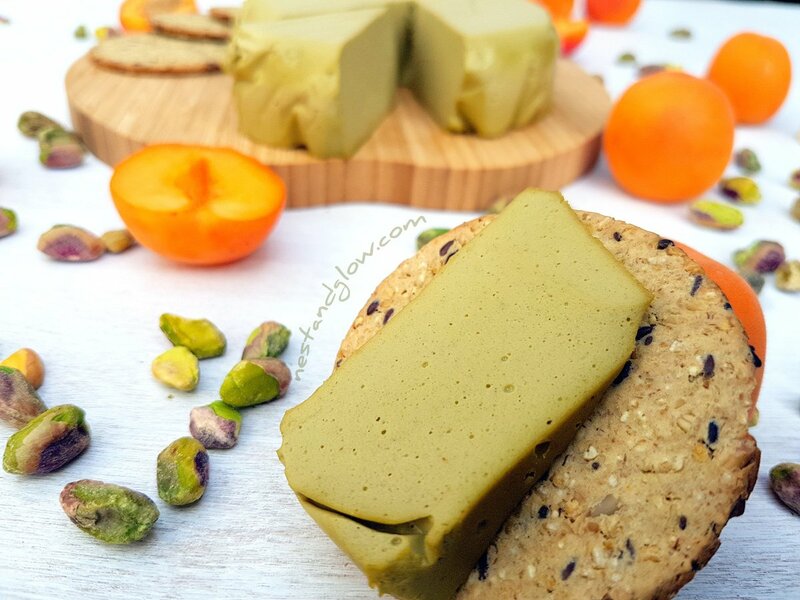 It’s better to make this vegan cheese than just eating the pistachio nuts as they are sprouted meaning the goodness and nutrients are easily digested. 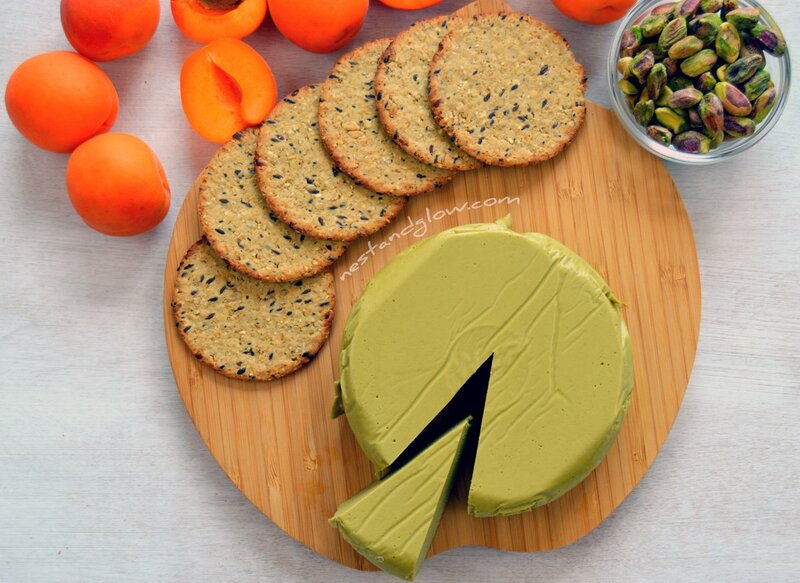 The cheese is oil-free and contains heart healthy fats from the pistachio nuts. Also full of B vitamins and you can use a brand of nutritional yeast with B-12 to get that elusive vitamin. Suitable for vegan, dairy-free, paleo, plant-based, gluten-free. and general healthy diets. 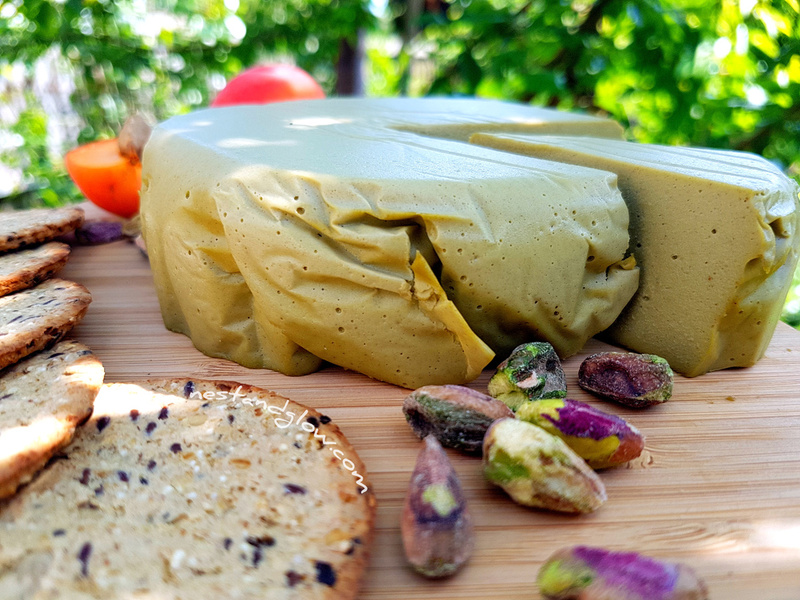 The pistachio nuts for this nut cheese are soaked in salted water to sprout them and make the nutrients more bioavailable. This is called activating nuts and apparently was part of several ancient cultures like the Aborigines. If you are short of time then just soak for 15 mins, but it’s best to soak for 8 hours or overnight. This nut cheese will probably take other ingredients as flavours really well. Next time I may try it with dried apricots, rose essence or dried cranberries. I love vegan cheeses with my palm oil free oatcakes recipe. They are made from gluten-free oats and a mixture of five different seeds. However you can use watever seeds you have in your cupboards. This vegan cheese ended up more yellow than the bright green I was hoping for, but this isn’t really surprising as the nuts inside are mostly yellow and the nutritional yeast is yellow. To make the pistachio cheese a bright green I would suggest adding 1/4 tsp of green powder such as spirulina, wheatgrass or barley grass. You won’t taste it but it will give a deeper green colour and a nutrient boost. I’ve found that this dairy free cheese is great to have with berries – the nutty green cheese looks and tastes great with tart raspberries. I use the pre-shelled unsalted pistachio nuts to make this. I believe this type of nuts has been lightly roasted, but at a lower temperature than normal shelled roasted and salted pistachios so they wouldn’t be considered raw. Think of this recipe as a base recipe to add different flavours to suit your tastes. Please do let me know how you get on in the comments or tagging me on social media @nestandglow on Instagram. If you like this recipe but are looking for a nut free vegan cheese check out my sunflower seed cheese. It’s another dairy free healthy cheese that can be sliced and grated! Soak the pistachio nuts in water with a pinch of salt for an hour or overnight. Take off the heat and stir in the pistachio mixture until combined. Pour into a mould and then chill for 2 hours. Do the pistachios need to be raw? I made this yesterday and it is awesome!! My husband can’t eat much garlic so rather than use two cloves I used 1/4 tsp of powdered garlic. Today I took a portion and added some dried dill to it. Love it. It is great spread on thin rounds of carrot. I used raw pistachios from Nuts.com. I have also put some in the freezer to see if it freezes ok. It is just the two of us so this is very rich, we certainly wouldn’t eat this all up in 2 or 3 days…or at least shouldn’t! Lol. Can this be frozen and then used later? I followed every single step and ingredient. My “cheese” did not come together at all, the texture was watery all throughout!!!! So frustrated! I made this delicious cheese today, love it! I will use less maple syrup and a little more salt and nooch. Thank you! Hi from Australia, just wondering what size tablespoon you use, 15 ml I am assuming? Thank you! Also wondering if the 2 pinches of salt go into making the recipe (aside from the 1 pinch to soak the nuts)? Hi, the 2 pinches of salt are in total – one for the soaking and one in the final cheese. But you might want to adjust the amount for the final cheese to your taste as some like it a bit saltier. Can I change the agar agar by guar gum or xanthan? Like Deborah, I will use less maple syrup (I intend not to use any) and “up” the salt and nutritional yeast. As is, the recipe is too sweet for my taste. Hi, I made this a few weeks ago, mine turned out more like “Pate”‘ wondering if you bring the agar agar and water to the boil and then simmer, also I used a 4 1/2 inch Spring pan and still had almost half as much mixture again and, last question, do you use 15 ml or 20 ml tablespoons? Thank you. 1 cup is 100 gram according to Google. I just measured with a measuring cup and sacle and mine is 118. But definitely not 150…. In addition 40g is not 1/2 cup. It is almost 1 cup ! I meant to say that it was 118gram Without shells. I buy them without the shells so I can use them right away. Thank you for your beautifull recipes. i have one one question, about the water in which you soak the seeds and nuts.Do you discard it or re-use it in the recipe. I wondered cause the soaking might remove toxin -like substances in which case you should discard it and if that’s not the case you might reuse it cause it might contain some water-soluble vitamins from the nuts in it. What’s the case here? Thanks so much for your lovely comments – that’s so nice to hear. I do discard it as I follow the train of thought that it contains the enzyme inhibitors/antinutrients. However, if you don’t add the salt it’s said to be beneficial to use to water plants as while it may not be good for us it’s said to be good for them. As with many of these things where there is little money to investigate there isn’t studies to back it up, but it seems logical to me but I’m always open to learn more. Hi, can I leave the nutritional yeast out and still have the recipe work? I cannot eat it. Is there something I could substitute for it? Thanks! Hi Victoria, the recipe will still work but it will taste a bit different. It’s hard to replace the nootch as it gives the cheesy nutty taste but how about some yeast extract instead? Then reduce the salt as yeast extract is salty. Maybe a lil yeast extract/marmite may work. Just a little though! I am wondering if the nuts are one cup with shells or without the shells? Hi Bastian, loving the sound of these vegan cheese recipes, however, the previous two I’ve tried to make, from a different site but using similar methods, have not firmed up much. One had a slight ‘jelly-like’ texture, the other was essentially ‘spreadable’. I followed the recipes to the letter so I’m confused as to why this is. I use agar agar powder, not flakes. I’ve also combined tapioca starch in one to help, but it did not work. I’m wondering if you can double up on the amount of agar agar to make sure the cheese is firm, cuttable and shred fable? Will doing his cause it to go too hard, affect flavour? Thanks in advance for any advice. Hi Chris, sorry to hear some others didn’t turn out too well. Yes I would double up on the agar agar – I used heaped tsp rather than level ones and if your cheese is spreadable then doubling it sounds like the right amount to get the correct firmness. It will still spread when very set but only after more pressure, it won’t ever be the same constancy as normal cheese (as its less fat based and more water based) but should slice and grate nicely. Let me know how you get on. I tried your recipe and it came out looking good. The texture is a little ‘spongy’ and gelatinous, which takes away some of the enjoyment of eating it. The flavour is decent and I added a little spirulina to deepen the colour. I was wondering if I could perhaps replace the water by ‘curdling’ some soya milk with apple cider vinegar. Maybe this would create a more cheese like texture? Love your recipes! I avoid consuming nutritional yeast. What can replace it? Hey there, thanks so much! How about using east extract spread in its place? Thank you so much for your recipe. My husband is allergic to apple cider. Can I use a different one? Hi Cassie what kind of paper do you use for wrapping your mold? Hi there, I’m using what we call greaseproof paper in the UK. Could I make it without maple syrup for less sweetness (like my cheese p savory), or is it needed for texture? Nest and Glow. This recipe looks great. Is this sweet or savory? I’m assuming sweet due to maple syrup which I’m sure we can skip. But – Do you need the final step with agar? I only have the syrup agar agar and I can do without the extra sugar. Hi there its more savoury with a hint of sweetness but the syrup is totally optional. You need the agar agar to help it set else will just be a liquid. Can leave that and the water its boiled in to make a pate instead. I’m running short on time and didn’t read through all the comments. I’ve always heard good things about nutritional yeast but my experience with it has been far from good. I’m a diabetic with Celiac and do better avoiding animal products and any grains. Is there another suggestion for the nutritional yeast or is there a brand that is 100% grain free? Hi there, I replied to your other comment but I use Marigold Engevita. Nutritional yeast should be gluten free as it’s grown on molasses and not grains. But do check the back of the packet. Hi, I can’t find the agar power. Can I use fruit pectin instead? Thanks! Hi, I cannot find agar agar powder. Can I use fruit pectin instead? Thanks so much! I have agar agar flakes in my pantry. If I “grind” them up in my spice grinder, will that work as a powder? Yes, it most certainly will. Grinding into a powder is how it’s generally used.